And we’re off to new heights and new places! 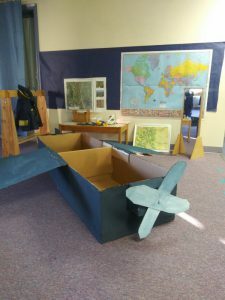 Our dramatic play areas are set up with airplanes and explorer’s gear in anticipation of studying the geography of South America. We will learn about some of the amazing features of this continent and each student will create a map with mountains, rivers, jungles, and plains. 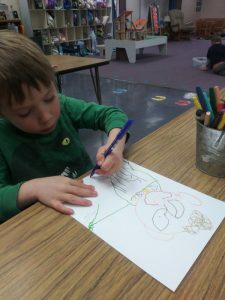 The students worked on self portraits this week. 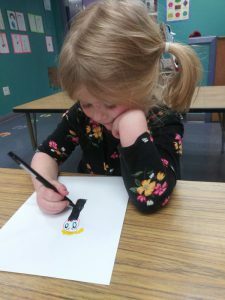 It amazing to see the a new level of self awareness emerge as preschoolers are now adding more details like eyelashes, jewelry, and clothing details. We also eased back into the scissors curriculum with an owl fringing project. 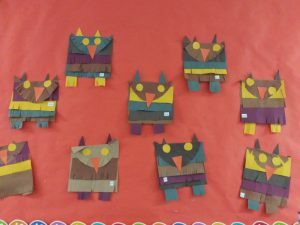 Students worked on fringing owl feathers and followed three step directions in gluing together the pieces. The owls tried out so well! 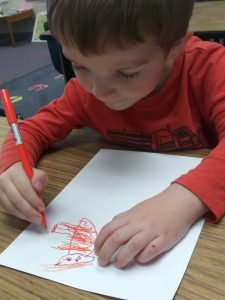 The preschool classes will be adding a weekly rotating job schedule. 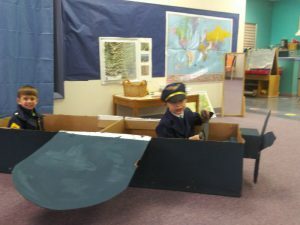 Preschoolers will be responsible for picking up lunch tickets, straightening out the classroom bookshelves, holding the outside doors open, and leading the line down the hallways. Each student will get a chance to have job. Students have also been busy working on math and literacy skills and we look forward to sharing their growth with you during parent/teacher conferences next month!